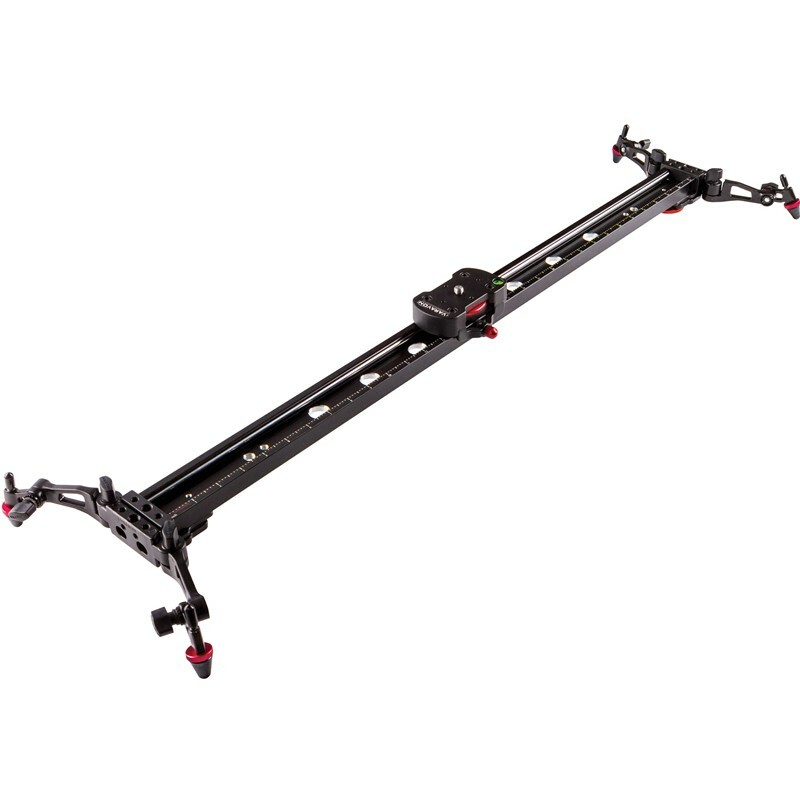 The Varavon Slidecam V-600 Camera Slider is approximately 1.97 ft long and features three ball bearing sliding rollers. The slider track incorporates three sets of 1/4"-20 and 3/8"-16 mounting holes, allowing you to support it in the center or at both ends. Two removable height adjustable legs are also included for using the slider on the ground. The legs provide height adjustment for leveling, and are articulated, allowing you to adjust them for rough surfaces. The slider weighs under 5 lbs and supports up to 44 lbs of weight, The slider carriage features a 3/8"-16 threaded mounting screw with a large thumb wheel to tighten down available flat base heads. It features a friction break mechanism that can apply tension, or lock the carriage in place along the rails. The carriage incorporates a built-in bubble level that allows you to confirm the level of the track. The track is pre-indexed so you can measure and repeat your move precisely. The included oil seal is used to clean and oil the chrome plated track, and you can use the included carry case for transport of storage. - The slider platform rides on three wheels with sealed bearings, and it is captive in the track bed. This allows you to flip the track over and get that inverted shot, without worrying that the carriage will fall off the tracks. - The end caps of the track feature 1/4"-20 and 3/8"-16 mounting holes that allow you to mount the included articulating feet, or other available accessories. - The 6mm diameter rails are chrome coated to protect them from rust and corrosion. - The track is light and strong, featuring machined holes that relieve excess weight, and provide additional strength. - The track comes inscribed with a graduated ruler, so you can mark your moves and make them repeatable. - The feet are removable and attach to the track using a large easy to use spin wheel. - The removable feet feature two points of articulation providing 180° of horizontal position adjustment, and 90° of vertical adjustment.